Ascending Butterfly: Find out why this @HelloBeautiful X @LatinistaFW TECH: THE NEW FASHIONISTA #NYFW #TechTalk Collab @SonySquareNYC #SonySquareNYC will have you wanting this Light Bulb for Christmas! Find out why this @HelloBeautiful X @LatinistaFW TECH: THE NEW FASHIONISTA #NYFW #TechTalk Collab @SonySquareNYC #SonySquareNYC will have you wanting this Light Bulb for Christmas! This is NOT a Compensated or Sponsored Post. 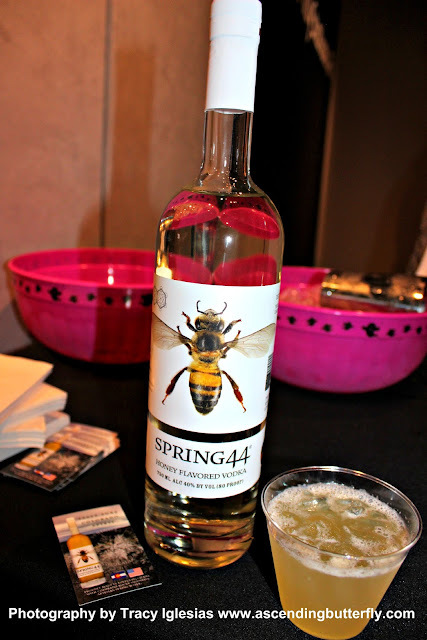 It is an Event Recap and the product being featured I WON in a raffle! I'll bet you were thinking I forgot Fashion Week completely as I hadn't posted my featured event yet. This year there were quite a few events that focused on the intersection between Technology and Fashion, which couldn't have made me happier, or kept me busier. This was one of the year's I was happy about being over-scheduled. I do have a stand out event this year, and it is an event that focused on Tech and Fashion and I figured that #TechThursday on the interwebs was the perfect day to hit you with it. Hello Beautiful and Latinista hosted a tech talk called: TECH: THE NEW FASHIONISTA How Tech Is Changing The Way We Live. The event was held at Sony Square NYC. Nestled in the bustling Flatiron District, Sony Square NYC is a PUBLIC space committed to showcasing innovations in products, movies, music and gaming igniting creativity and curiosity through extraordinary experiences, you can catch product launches, creative workshops, live performances and more. 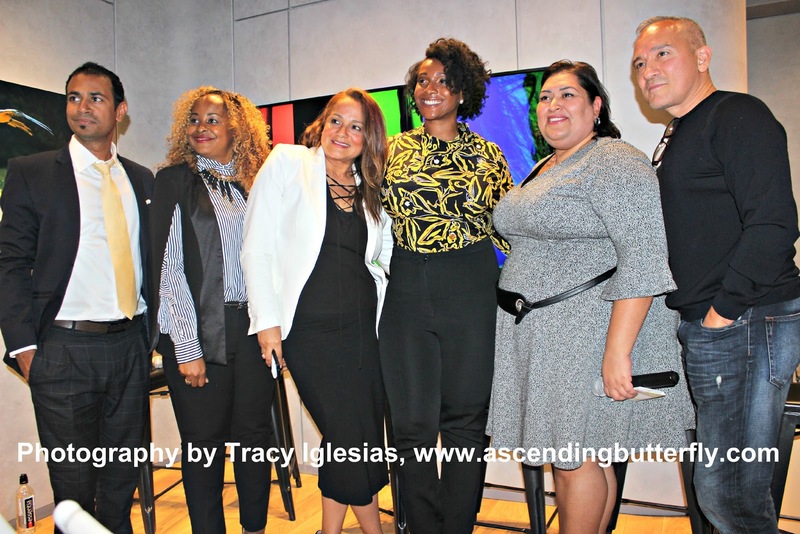 It was a great venue for this event being held during New York Fashion Week and talking Tech. Currently the space is hosting an a7R III Photo Exhibition (10/25 - 11/27) from 10 am to 7pm EST - view the extraordinary images created with Sony's newest camera - this is perfect for me after hitting the Photo Plus Expo, I am more inspired than ever to get more creative with my Photography! More on my takeaways from Photo Plus Expo to come. Separate Post, Promise. From 11/3 - 01/08/18 you can also Experience PlayStation and get hands on with a variety of games across multiple PlayStation Platforms. So if you are considering a PlayStation for anyone on your holiday shopping list this year, this one is for you. and as for the DJ, now that is where it gets interesting! Music was coming from some creative places. Places where light and music combine. And the sound was warm and immersive and doing a bang up job filling a space where tons of editors were talking. 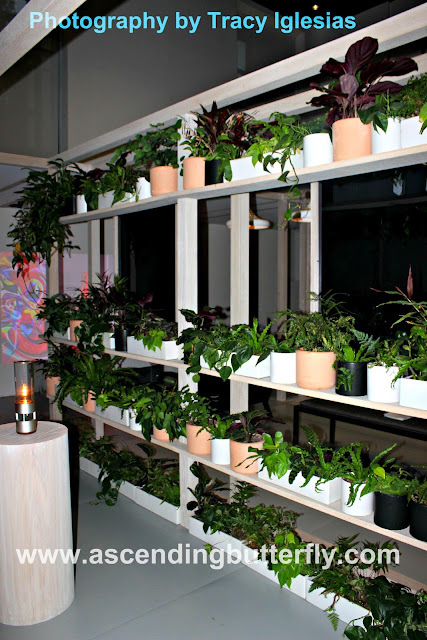 The Sony LSPX-S1 Glass Sound Speaker was hidden among a row of plants! At the end of the panel during the networking session Sony hosted a raffle for a different product one that was overhead, the LED Bulb Speaker, and take a guess who won? And you guys know I test any tech product for at least thirty full days before even mentioning it to you. 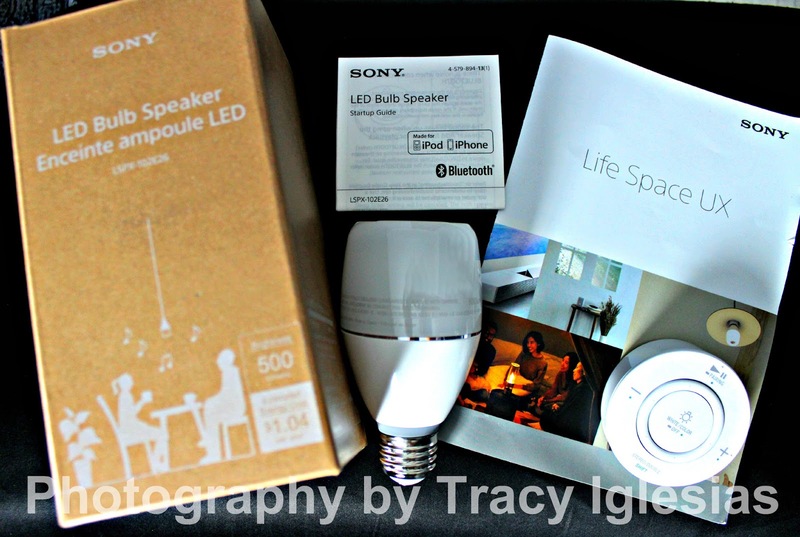 I have put the SONY LSPX-102E26 LED Bulb Speaker to the test and was surprised at the ease of set up, it was as easy as screwing in a light bulb, literally. It paired super fast and easy with ALL my music from owned to subscription, played nicely with ALL my devices from android, desktop, windows laptop and all my portables. It surprised me by pairing with no trouble to a really old iPod of mine, and most wireless speakers give me trouble with that one. I now literally want one of these bulbs in every room. I sort of wish I had put this bulb in the kitchen or bathroom, so I may have to pick up a few more. I never thought I would be recommending a Light Bulb for the holidays, but you should definitely add this one to your list for Santa. it takes up the least space, has immersive sound and pairs easily with a wide variety of devices. With print magazines struggling financially and many going out of business, Influencers are changing the Media Game. Blogs have changed the face of Lifestyle Stories. People are more interested in seeing a person whose lifestyle is similar to their own wearing fashion instead of celebrities, blog reviews are the new consumer reports. It's all about Real People putting products to the test and sharing the good, the bad and ugly. Are lines getting blurry? That depends on the blogger. You are always going to get real talk from me. The biggest 'concession' I am willing to make is with-holding a review when I get a stinker so the brand can work on it. And some stuff is so bad it just doesn't make my pages at all by MY choice, not theirs. Designers are coming straight to Bloggers, dressing them, collaborating with them and putting us front row at their Fashion Shows which I have been doing for years. It started with "Print" Magazine Editors cursing me out and trying to get me to move to the back because the front row was 'for them', and I stood my ground brass balls style in the very beginning and love that it happened so much less this year. I am the Rosa Parks of Bloggers when it comes to Fashion Week, if a designer tells me I'm in the front row, then I am holding my ground. I let no one move me back and I don't let Editors intimidate me. Tech and Fashion have been intersecting, are intersecting and I love that I talk both languages. Tech is second nature to me (former Tech Recruiter) and as an Entrepreneur and Professional Woman my Fashion choices continue to evolve with the places I find myself walking in life. Tech and Fashion have been intersecting for me for quite awhile and I wouldn't have it any other way. This event was a breath of fresh air during New York Fashion Week as far as I'm concerned and hope to see more of these smart talks next season. Spill Butterflies: Where are YOU going for Reviews? (Feel free to share who you love to read, I was reading blogs before I began contributing to them and I was actually contributing to Brand Blogs before I even started my own.) Are you reading more digital and less print? Do you have a favorite Wireless Speaker? If so, please let me know which one it is as I am an audiophile! FTC Disclosure: This is NOT a sponsored post or compensated. This is an event recap and a product review for a product I WON and was no under obligation to write about. The event was sponsored, this review is NOT. All opinions are 100% my own! I am disclosing this in accordance with the Federal Trade Commission 16 CFR, Part 255 - Guides Concerning the use of endorsements and testimonials in advertising, you may check our Giveaway & Disclosure Page for additional information regarding Ascending Butterfly Disclosure. Things that lure this butterfly out of her cocoon: Technology, Travel, Fashion, Beauty, Spirits (Sparkling, Champagne, Prosecco, Sake, Bourbon, Craft Brews), Foodie Fun - really I'm such a *simple girl*. That sounds like it was an awesome event. I'd love to get my hands on that VR headset. @Stacie Photo Plus was co-branded with the Virtual Reality Show this year in NYC so I have more posts to come on this technology and future trends. VR demos are always fun and it's amazing to see how far it is advancing. That is totally awesome. I love tech in all its forms, and this looks like it was a great tech extravaganza. @Bill A definite oddity during Fashion Week which is what made this event stand out for me even more. What a night! Tech and honey flavored vodka? Yes, please! I love it! That VR headset looks amazing. I'm super interested in that technology. @Danielle Will post more about it soon as I recently attended the Virtual Reality Show in NYC, it was co-located with Photo Plus Expo at the Jacob Javitz in New York City! Sounds like it was a bang up event! I would love to attend events like this! Tech and blogger go hand in hand! So good to have some focus on it! Learning about tech and fashion coming together sounds so interesting! I like that they're discussing the role of influencers in marketing. @Liz Me too, and not just behind closed doors, but WITH the influencers directly. I think collaborations can only get better with brand and blogger working together for a common cause, to improve the quality of co-branded content. haha we think so much alike. The event looks like it was great but I was thinking....OK, where's the cocktails! There's nothing better than being in a Sony event like this! There's so much to expect with their products! Really curious about that light bulb speaker. @AnnMarie Sony, LG and Samsung tend to set the bar high and be ahead of the curve and the trends, their events are always fun for me! That's pretty amazing! It's so nice to be part of events like this. Technology is definitely stepping up and Sony knows what they're doing. @Carol I loved that this event was hosted during Fashion Week even more! I would have loved to have been at this event! I love tech and it really has changed the way I live! @Kelly Technology is just getting smarter and smarter and more useful, it is great to be at the forefront of these conversations. Oh wow this looks like a great event! I love learning about fashion! I love tech and enjoy reading reviews from bloggers. Sounds like a fun event and the cocktails sound good. So do I, it's way more helpful to me to read about a product from someone a bit more relatable, celebs can be great ambassadors as well, but their lifestyles are not often similar to our own. Sounds like such a great event! I love that Sony glass speaker! I would love one of those for Christmas. This sounds like a really cool event! The glass speaker looks amazing. Perfect gift for the holidays! I love technology! Sounds like a great experience at fashion week! I appreciate that you stood your ground. I had a similar experience where bloggers were moved to one side so the "real media" could come in. Ugh. But that's changing and brands are realizing the value of working with bloggers. @Crystal I can bet I know which company it was. They are company non-grata with me and I will NEVER feature them or work with them again. Bloggers need to understand the power of their influence and be sure to demand professional treatment at all times. The level of work that goes into one post - Hi Res Digital Photography that must be edited and optimized for their blog's layout, HTML coding, Content Production, Editorial Calendars, the PR and Marketing that goes behind every post to give it traffic and the amplifications on Social Media in addition to moderating an ever growing community is incredibly challenging work. If a brand does not respect your value they are one you shouldn't work with. I hope you didn't cover that event. If you were legit press for them to reach out to you to cover it, telling you to move over for 'legit press' is something you should protest by leaving the event and letting the rep that reached out to you know that you refuse to cover it and won't mention them or their products. or conversely write about the horrible treatment as the focus of the post, either way is equally effective at making yourself and the value of your time, efforts, energy and hard work understood. I have a couple of them wanting a ps4 this year. Definitely thankful for the heads up on this info. @Maria - Ps4 and Xbox are always popular at this time of year and VR is definitely on a lot of wish lists this year! I would have loved to check out the VR sets. That stuff is so much fun and really amazing. @Sara The funny thing is I got to play with VR technology a bit before it even launched to the public and I am still amazed at how far it continues to grow, it really is its own world. This sounds like an interesting event. I've never heard of Honey Vodka before! All of my wireless speakers are getting old, so I will have to check out the SONY speaker. @Marysa Wireless Speakers just keep getting better and better, but I think combining the Speaker with a programmable light bulb is sheer genius and I have really been enjoying mine, no wires to worry about and it was super easy to set up, I want one for every room now! This sounds like an awesome event. I love attending events too. They can be so much fun. Looks like some amazing products too! @Kathy I have been way more selective in regards to events this year especially, but I rarely miss a good tech event. This looks like a fun event. I wish that I was able to go to more events. It is always fun meeting other bloggers and putting a face with a website. @uprunforlife I have had less time for them myself, but it is definitely fun putting a face to the blog for sure! I've never heard of honey flavored vodka before. Wowsers, sounds delicious and like it was a helpful event! Wow, sounds like you collected quite the information on some technology. I could have definitely used that heads up information at the event. @Marissa This was definitely informative! This sounds like such a fun event! This is all really great information, I would have loved to learn more about the VR stuff. 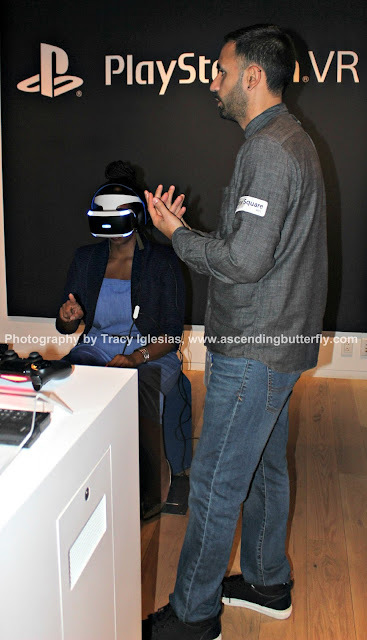 The Virtual Reality Demo at Sony Square Space NYC looked pretty sweet too, I would love to try that out one day! How cool! Looks like it was a fun event. I would love a new VR headset for Christmas. Thanks for sharing!